second to none. I am very happy with my table and will recommend your company to any/all who are looking for a table." I would consider my self fairly handy and have experience with stretching fabric and upholstery. and there were no issues with missing pieces or workmanship. Thanks a lot! " end the table arrived. I was very impressed by the quality out of the box. Everything was rock solid with a beautiful finish. A couple of small issues: 2 of 4 cues were a little crooked but 1 email later and Patrick was quick to send 2 new ones. also excellent as promised. I will recommend you to any prospective buyers. " how well it all went together and how well built it is. Very happy. " " J’ai été impressionné par votre service remarquable tant au niveau de la vente que le service d’installation." you how satisfied we were of your service for both purchases we've made from you. " “ The experience was excellent! 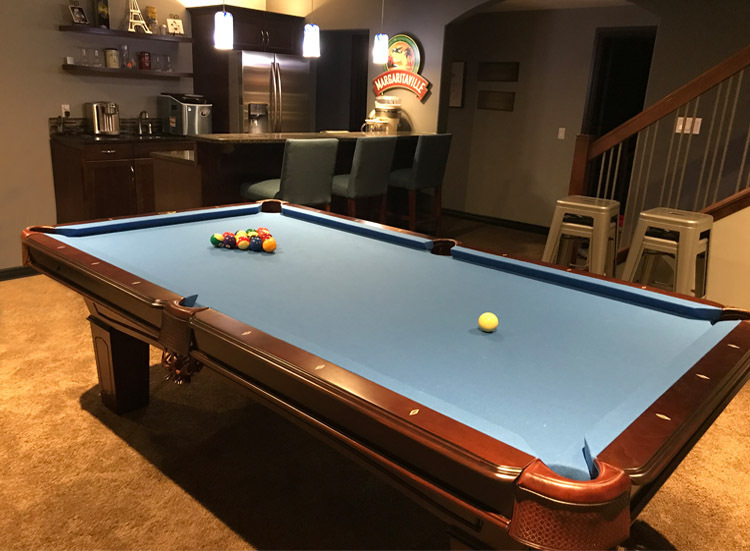 We are very satisfied with our pool table and are having a lot of fun using it.